On the subject of Scales of Nafaalilargus, I agree that the enchantment should be changed. It's not very appropriate to have full resistance to fire when Nafaalilargus' one weakness was to dragonfire (i.e. magical fire). Something like resist normal weapons would make more sense since he was technically invulnerable to Cyrus' sabre. That could get overpowered quickly though. For the new artifacts in the potential area, this list can grow based on people wanting to submit their own new idea for an artifact. The list so far is just the ones I though of except for the Gossamer Gown. Something for a Hammerfell project: the Soul Sword containing Prince A'tor's soul. If a hammerfell project ever does happen, then yeah, the soul sword, maybe Cyrus's Cutlass. I would move the Ra'Gada items and the Ansei Amulet from High Rock to there also. 1. Apotheosis - powerful wooden staff, which casts fire, frost, and shock damage to its target. 2. Battle Axe of Mehrunes Dagon. Can be seen on statues. 3. Roses of Sithis - artifact arrows, can be more powerful than daedric. Dark Brotherhood owned. Yeah, those are good ideas. Rose of sithis is just a single arrow iirc in oblivion. So having a set of them would be good. Added your suggestions to the list. I name Dagons Axe as Fury Spike to have a less generic name. Fury Spike is the name of one of the towers in the dead lands. Roses of Sithis as a black marsh artifacts. Belong to a Sithis Cult and not DB. Apothesis would be a staff somewhere in Cyrodiil. These are some ideas from R-Zero on PT discord. Added to the list. A spear with a flag attached and wrapped around it. Used by Bendu Olo during his Thras campaign, enchanted by Syrabane. Cleanses whoever is hit by it from disease. Keep in mind that TR and PT will be going with pre-Oblivion DB lore, so they won't be a Sithis-worshipping cult. The Brotherhood of Seth based in Argonia take on the cultish characteristics, but the lore is rather different from the DB. That's good to know. Could change the descriptions on these. Rose of Sithis arrows for example should just be something that a cult of sithis has perhaps? And not the DB. 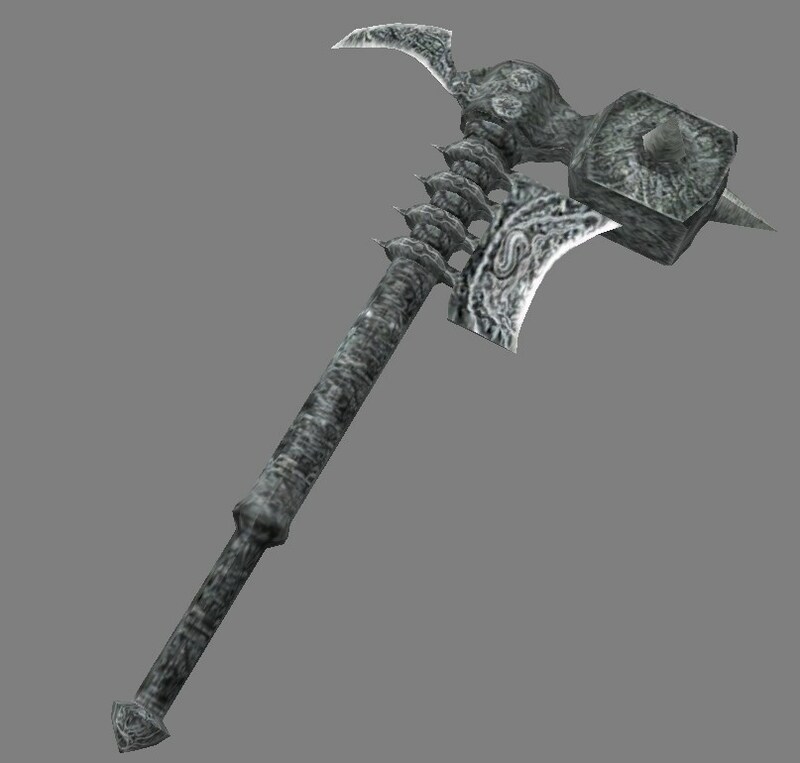 This overachieving thing (a somewhat unexplainable combination of axe and warhammer) might be the legendary *Hammer of Olfor* mentioned in forgotten Arena/Daggerfall Nord greetings (if that's not already a SHotN claim).